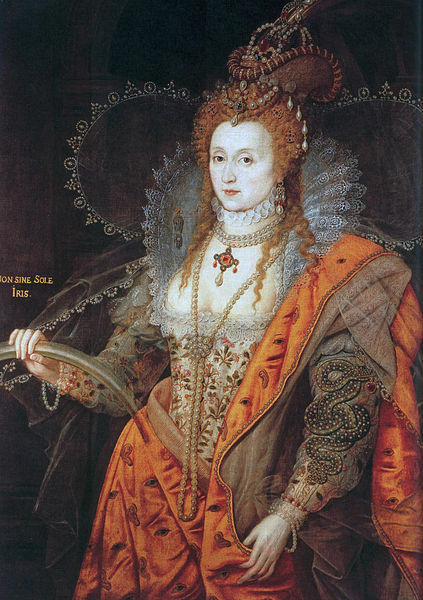 When she was born, no one thought Elizabeth I of England (1533-1603) would grow up to become queen, let alone one of the greatest queens in history. Her more than 40 years on the throne brought relative peace and prosperity to England after the unsettling reigns of her half-brother Edward and half sister, Mary and before that, of their father, Henry VIII. She was the daughter of Henry and his second wife, Anne Boleyn. Her birth was disastrous for her mother as she was not the son and heir Henry desperately wanted. Anne later miscarried a son ironically on the day of Catherine of Aragon's (his first wife) funeral. By that time Henry had already set his eyes on his future third wife, Jane Seymour. Elizabeth lost her mother when she was not yet 3. 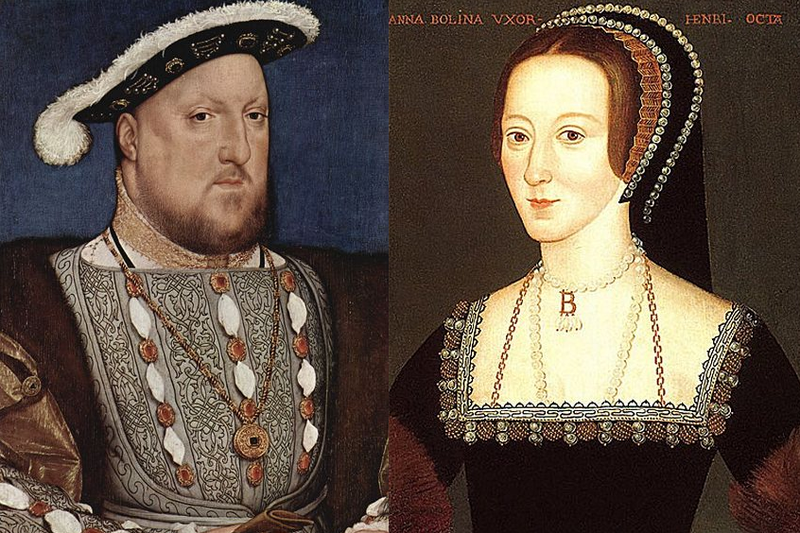 Henry had Anne executed on trumped up charges of adultery so he could be free to marry again. She was a precocious child even at that tender age. She asked her household governor why she was called "my lady princess" one day and then just plain "my lady" the next. Henry had had his daughter declared illegitimate and she was removed from the line of succession for a time. While Henry rarely saw Elizabeth, he did provide for her and she idolized him. Like her father, Elizabeth was highly intelligent and she thrived under the tutelage of some of the best scholars of her time. Her education and gift for languages stood her in good stead when she became queen. No one knows when Elizabeth found out about her mother but it must have deeply affected her as she rarely referred to Anne Boleyn as an adult. She also didn't want to draw attention to her illegitimacy which was never rescinded. However, one surviving piece of jewelry is her locket ring, which now belongs to the Chequers Trust. 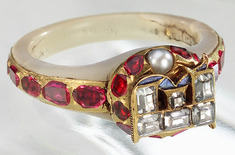 This lovely ruby, diamond and pearl ring opens up displaying 2 miniature enamel portraits. One is that of Elizabeth when she was in her 40's. The other is of her mother. 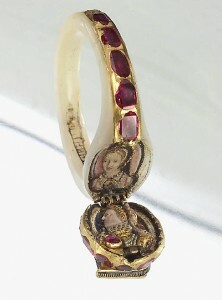 Her silent bond to Anne was through this ring which she wore right up to her death. Adversity in her youth strengthened her for her future role. Elizabeth learned the hard way how to keep her mouth shut, not to draw attention to herself and to control her emotions. Her reputation was nearly tarnished as a 14-year-old by a much older man who should have known better. She was living with her stepmother, the saintly Catherine Parr, Henry's last wife and widow at the time. Catherine quickly put her out of harm's way when she discovered her husband, Thomas Seymour, attempting to seduce Elizabeth. A far more dangerous period came along later when her half sister, the staunchly Catholic Mary, had become queen after the early death of their half brother, Edward VI, Henry's heir. Mary was convinced Elizabeth was a closet Protestant - which she was. When she was 21, Elizabeth spent a terrifying 3 months in the Tower of London on suspicion of involvement with a Protestant rebellion. Each day she thought might be her last. She remembered, "I stood in danger of my life; my sister was so incensed against me." Elizabeth became queen of England at 25 after Mary died. She had survived a turbulent time and still face many more challenges ahead. The England Elizabeth inherited was not a wealthy one and beset with financial, religious and political problems. Both France and Spain, far more powerful nations, were serious threats to England's sovereignty. After her sister's murderous reign when 300 Protestants were burnt at the stake - Mary's brutal effort to return England back to the Catholic fold - her people too were very wary of another woman on the throne. 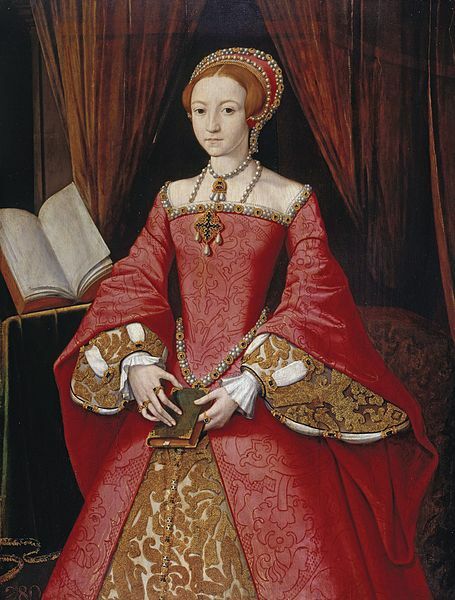 Queen Mary I "Bloody Mary"
So one of the first acts Elizabeth did was to choose her advisers wisely. Her chief and best, most loyal councilor was William Cecil who served her for decades. He was discrete, hard working and above all, a wise man. The other man she leaned on for much of her reign was the dashing Robert Dudley, the 1st Earl of Leicester, a childhood friend. He was the same age as her and they had much in common. Dudley had also spent time in the Tower and feared for his life around the time of her own incarceration so it was a shared experience. Pair of stamp size miniatures of Elizabeth I and her favourite Robert Dudley, Earl of Leicester. Dudley was the only man she ever really loved. He was a good match for her in many ways - well educated, attractive, witty, athletic, cultivated and able to dance and sing as well. Elizabeth loved to dance and she made no secret of her attraction for him. She showered titles and favors on him. For years Dudley hoped to marry her but he was not a free man. When his ailing wife was found dead in mysterious circumstances, his chances of marrying Elizabeth did not improve but were instead dashed forever. The suspicion he might have had her killed in order to free himself for marriage to his queen dogged him for the rest of his days. His lifelong affection for her was real though. Everyone expected her to marry and produce an heir. But Elizabeth firmly and consistently said she would marry no one. Dudley once recalled Elizabeth declaring she would never marry when she was just 8. This was around the time when her father, Henry had his 5th wife, the young and flighty, Catherine Howard, executed. The sticky issue of marriage remained for years. The House of Commons even sent a petition asking her to marry to secure the succession. Her reply? She showed her coronation ring and said, "I am already bound unto a husband, which is the kingdom of England." She promised that the kingdom would not be without an heir but consistently refused to name one. She went further and said, "In the end, this shall be for me sufficient, that a marble stone shall declare that a queen, having reigned such a time, lived and died a virgin." It was very hard for everyone to accept that she didn't want to marry as this was a very alien thought for her time. Elizabeth knew once she married, she would lose her independence. She also admitted certain events in her youth made her view the married state as a dangerous one. But that didn't stop the politically astute Elizabeth from entertaining the hopes of foreign royalty that she might marry one of them. She dangled them the carrot for years. Her subjects weren't too keen on any of them because they were all Catholic. But Elizabeth knew she had to be on friendly terms with much more powerful nations like Spain and France. 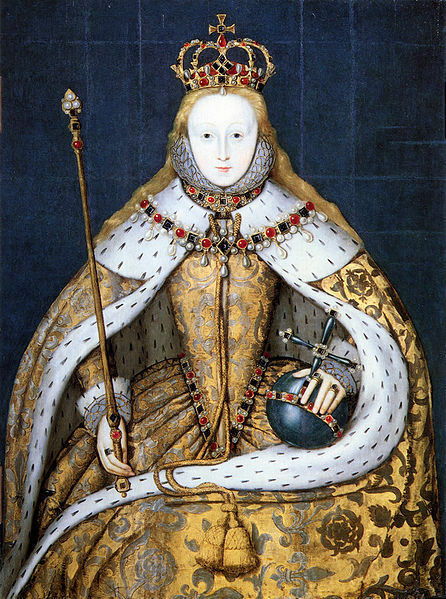 Elizabeth had to work at convincing people she was strong enough to rule on her own. She aimed for a stable and orderly government. One historian said, "her watchwords were to be caution, compromise and moderation." She made it absolutely clear to her Council and the members of the Commons she would not be easily manipulated just because she was a woman. Her councilors certainly found her stubborn and often unpredictable and not above shouting and swearing at them at times. Another issue she had to tackle when she became queen was the lack of money. She had to pay off Queen Mary's debts and finance the needs of the court and government. She sold off Crown lands and lived within her means - her expenses stayed under £300,000 per annum throughout her long reign. Some called her mean but she was in reality prudent with her finances. But she knew she still had to set the tone for her status. Her legendary wardrobe consisted of some 3000 elaborate gowns encrusted in gems. These were mainly for official functions as she herself had simple tastes. It took her ladies 2 hours to get her ready each day. She wore so many jewels she often bedazzled observers in candlelight. 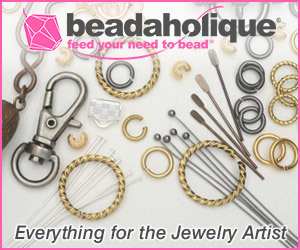 Her extensive jewelry collection (over 600 pieces in 1587) was so famous even the Pope was envious. Many of the pieces were inherited from her parents like her mother's initial "B" pendant shown in Anne Boleyn's portrait above. Courtiers also gifted her jewelry and she received many looted from Spanish treasure ships. Several pieces were engraved with her motto Semper Eadem (Always the Same). Her favorite pieces were in the shape of ships or animals or were novelty pieces with puns on her name or had symbolic meanings. This necklace is similar in feel to the 16th-century ship pendant given by Queen Elizabeth I to her cousin, Lord Hunsdon. 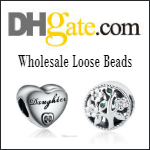 Pendants of ships grew in popularity during this time. One of her most spectacular pieces was the 6-stranded-necklace of large pearls which once belonged to Queen Mary of Scots. 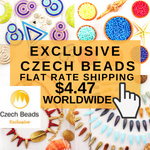 She outbid Queen Catherine de Medici of France for those. 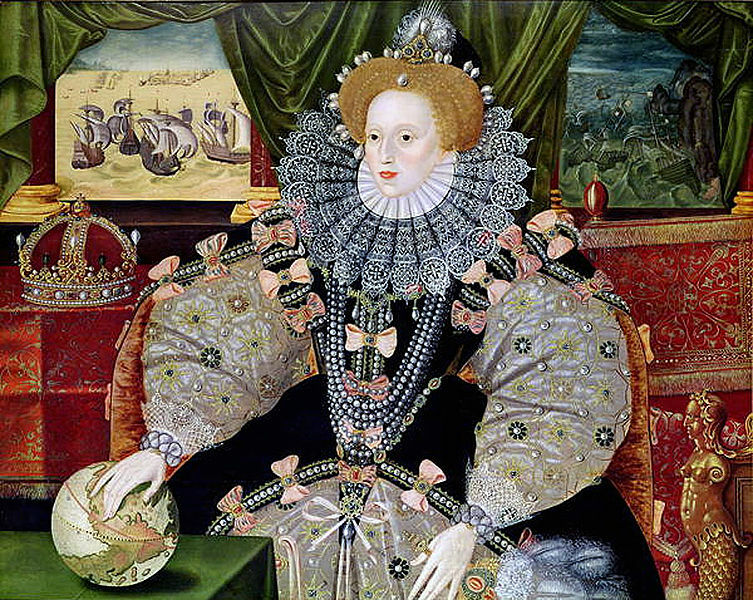 The pearls can be seen in several state portraits like the Armada portrait shown below. Pearls were a symbol of her virginity. Some of the pearls are now in the Imperial State Crown but most, like the majority of her jewelry collection, were dispersed after her death. Having lived through a harrowing time under her sister's rule, Elizabeth disliked religious extremes, Catholic or Protestant. 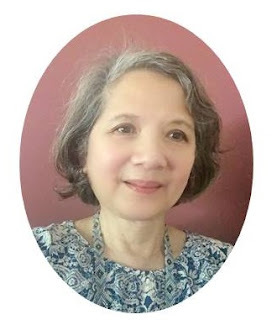 She killed a Puritan bill banning all entertainment and sports on Sunday because she thought people should be allowed to choose what they wished to do on the only day of rest they had. As head of the Anglican church, she insisted on retaining some features of Catholic ritual but in English in an effort to unite her people under her. But there was one religious based threat which was not so easily overcome. 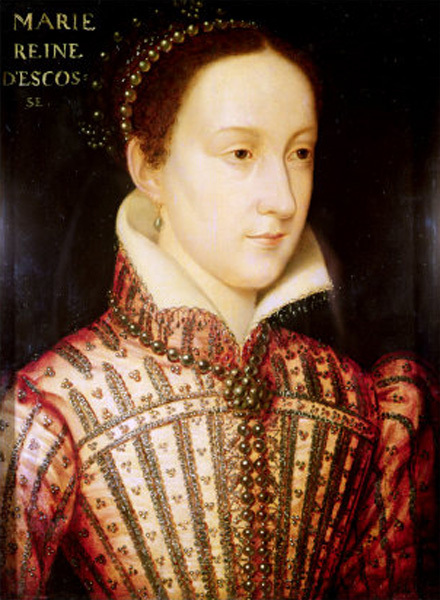 Mary, Queen of Scots, her cousin, had the strongest claim to the English succession. Mary was a courageous but foolish woman whose poor decisions ultimately cost her own son's allegiance and her life (see biography linked below). Mary fled to England after the Scottish nobles forced her to abdicate in favor of her young son. Her presence in England was untenable because Mary was a focus for Catholics in England who were against Elizabeth's rule. If Elizabeth was to die before Mary, then England would have a Catholic queen once more. Elizabeth agonized over the decision to execute Mary even after she knew Mary was plotting against her. But she reluctantly did so in the end.
" I know I have the body but of a weak and feeble woman, but I have the heart and stomach of a king, and of a King of England too, and think foul scorn that Parma or Spain, or any Prince of Europe should dare to invade the borders of my realm." A stylized depiction of key elements of the Armada story: the alarm beacons, Queen Elizabeth at Tilbury, and the sea battle at Gravelines. No invasion occurred and her people rejoiced. There were those, who criticized her inaction after the Armada crisis. Spain lost that battle but they still had the upper hand in the skirmishes between both nations. Elizabeth refused to succumb to any action which smacked of vainglory. Cecil paid her tribute, "There was never so wise woman born as Queen Elizabeth for she spake and understood all languages, know all estates and dispositions and prices, and particularly was so expert in the knowledge of her own realm as no councilor she had could tell her what she knew not before." Robert Dudley died not long after the Armada crisis from what historians believe to be stomach cancer. Elizabeth was grief stricken with the loss of a man who was close to her for over 30 years. She called him "her brother and best friend". He willed her a diamond and emerald pendant, a rope of 600 beautiful pearls...... and left his third wife with debts of £50,000! She cultivated the aura of the Virgin Queen for most of her years as monarch. Some doubted her virginity but the rumors of impropriety were not likely to be true because she never had any privacy. The cult of courtly love persisted right until her old age. This cult meant Elizabeth's portraits were almost all painted with the "mask of youth" - an eternally young looking queen even when she was old. 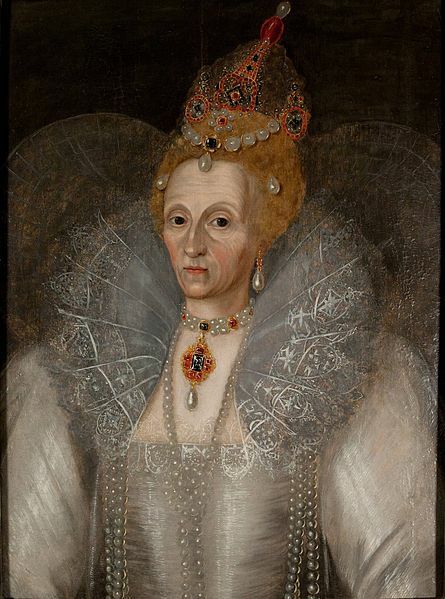 One exception is the portrait below showing an aged queen. She favored male courtiers with "invisible" wives -the men were expected to pay her attention in the way of a hopeless lover worships from afar. One courtier described it as "fishing for men's souls". She also hated Robert Dudley's third wife when he remarried (he denied marrying his second wife). It wasn't all one sided. She did fascinate men but kept them guessing all the time. She also had a wonderful sense of humor. The embarrassed Earl of Oxford went into self imposed exile for 7 years after breaking wind while bowing to her. When he returned, she received him warmly, and said with a twinkle in her eye, "My Lord, I had forgot the fart." Marked by her early experiences, she hated loud noises, couldn't stand closed windows and spaces and had intermittent panic attacks. But in general, Elizabeth enjoyed good health for much of her long life. She survived a couple of serious illnesses including a bout of smallpox. She exercised vigorously and had a lot of nervous energy and stamina often exhausting her courtiers and foreign ambassadors. She did her regular progresses or royal tours well into her old age which all contributed to her enormous popularity. As she grew older, she suffered from headaches and rheumatism. Things worsened after she was forced to have her upstart favorite, the irresponsible and ultimately rebellious 2nd Earl of Essex (stepson of Robert Dudley) executed for treason. Weary and sad after that, she suffered from bouts of depression in her final two years. She caught a cold. Fever set in, and she began to have trouble sleeping and eating. She refused to do what her doctors wanted or to go to bed. Instead she laid down on cushions on the floor. Her aides finally got her to bed where she eventually passed away in her sleep. She was 70. The Tudor dynasty drew to a close with her death. James VI of Scotland, Mary Queen of Scots' son became James I of England, uniting both nations for the first time. 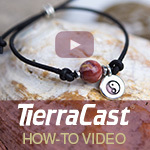 Very interesting and well written post! 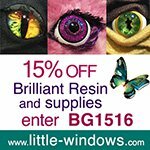 Wonderful post and proves that the lives of monarchs is not all that easy or stress free. Most of the time they lived in fear of losing their throne and losing their lives. I adore the Queen's ring and think it is as relevant in style today as it was during her lifetime. What a wonderful account of her as it shows both her strengths and weaknesses. She really was a fascinating woman. She was indeed a complicated but strong woman. I enjoyed writing about her. Sad really that she did not know her mother. I would never seek out these history lessons on my own so I'm glad you make them so fascinating! 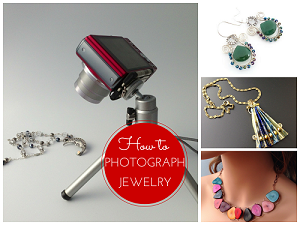 I just love your articles on jewels historical figures and ancient cultures. Thank you for such a wonderful site. Thanks Mary Ann! I love history too!